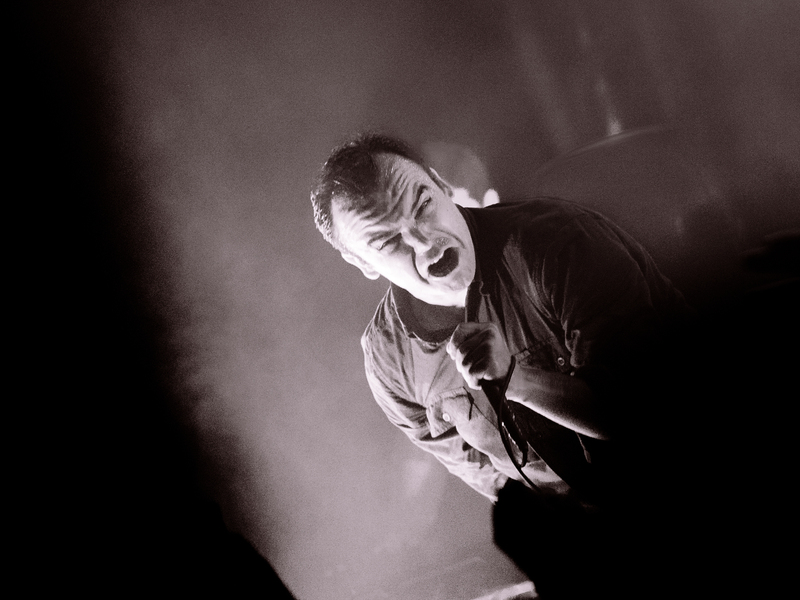 Click here to see a photo gallery from the Future Islands show. The last time Future Islands visited Philly they were crammed into the First Unitarian Church of Philadelphia on Chestnut Street. It was a packed house, sure, but it was a small packed house. Not long after that show, however, the band hit their tipping point. Now their following has grown to saturation, so much so that UT booked them for two consecutive nights this weekend, both shows selling out almost immediately. Entrancing the audience Jan. 10, Future Islands – comprising Gerrit Welmers on keyboards, William Cashion on bass guitar, Michael Lowry on drums, and Herring on a kaleidoscope of vocals – pulled heavily from 2014’s Singles, including (singles) “Seasons” and “Back in the Tall Grass,” and honored their early output with songs like “Beach Foam” from their first album, Wave Like Home (2008). Herring, a kinetic, acrobatic performer, juked and writhed around the stage, pounding his chest and forehead in apparent anguish and occasionally casting his gaze upward as though addressing some presence floating just above the crowd. Herring is something of a split-personality performer, cycling through a series of voices – each textured, emotive and just slightly bizarre – including a vaguely medieval British accent and a demonic growl reminiscent of Christian Bale’s snarling Batman. By all accounts, the frontman seemed about midway through an effective exorcism from first to final song. He was all but foaming at the mouth. It was a frenetic, cathartic performance – and it’s hard to imagine how Future Islands summoned the energy to do it all again the following night. It’s early in 2015, but we’ve already got a pretty hard act to follow.